Foreword. Introduction (M.G. Wade). Sections: I. Control and Coordination of Motor Skills. Control of Feedback from Abnormal Stereotyped Behaviors (G. Berkson and R.J. Gallagher). Precise Visual Information and Throwing Accuracy of Mentally Handicapped Subjects (W.E. Davis). The Development of the Postural and Voluntary Motor Control Systems in Down's Syndrome Children (M.H. Woollacott and A. Shumway-Cook). Early Motor Development and Stereotyped Behavior: The Effects of Semi-Circular Canal Stimulation (W.E. MacLean, Jr., R.E. Arendt and A.A. Baumeister). Comments on Coordination, Control and Skill Papers (K.M. Newell). II. Response Timing and Motor Behavior: A. Speed of Information-Processing, Intelligence, and Mental Retardation (P.A. Vernon). Attentional and Reaction Time Analysis of Performance: Implications for Research with Mentally Handicapped Persons (H.N. Zelaznik and S.K. Aufderheide). Reaction Time and the Study of Intelligence (J.C. Campione). III. Response Timing and Motor Behavior: B. Input, Central and Motor Segments of Response Time in Mentally Retarded and Normal Children (R. Karrer). Mental Development, Response Speed, and Neural Activity (J.H. Daruna)..Evoked Potentials, Response Timing, and Motor Behavior: A Response (G.C. Galbraith). IV. Training and Motor Skills. Process and Context in Ensuring Competent Motor Behavior by Mentally Retarded People (J. Hogg). Generalization and Motor Control: Implications for Instruction with Learners who Exhibit Severe Disabilities (R.H. Horner). Training for Transfer: Guidelines for Promoting Flexible Use of Trained Skills (A.L. Brown and J.C. Campione). 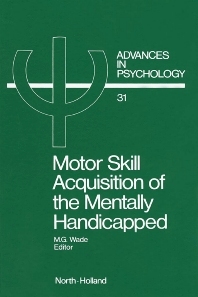 Based upon a conference held in Bethesda in 1985, this volume brings together the research and theoretical perspectives of experts in the developmental aspects of motor control, coordination, and skill in the mentally handicapped. This is accomplished within the context of cognition. Section I deals with the dynamics of controlling movement skill and the nature of the variables that mediate the learning of motor skills. Sections II and III examine the traditional area of research in motor behavior, i.e., the speed of information processing and reaction time paradigms. The last section discusses the issue of training to minimize the effects of mental retardation on motor behavior.